“Champagne?” the tuxedoed waiter asks, “Yes, that would wonderful,” I reply. I have just boarded the brand-new Silver Spirit in Monte Carlo for its first sailing with passengers. The moment is surreal and a far cry from my previous voyage a few months earlier during Silver Spirit’s sea trials when the vessel was still under construction and where instead of champagne I shared breakfast pizza and espressos with the shipyard workers onboard. I look around and I smile, long gone are the unfinished walls, protective covers of plastic and plywood — the ship has truly morphed into the beautiful Art Deco masterpiece it was designed to be. The 540-passenger, all-suite vessel is the first newbuild for ultra-luxury line Silversea Cruises since 2001, and it brings the Silversea fleet to a total of six vessels. “Silver Spirit is an evolution of what Silversea is all about,” says Amerigo Perasso, Silversea’s president and CEO. Perasso said that the larger vessel enables the line to create longer itineraries and offer more dining and entertainment options. The economic waters may be choppy, but for Silversea it’s smooth sailing. The line is reporting its highest bookings ever, which is due to the surprising global demand in luxury cruising. Loyal Silversea customers, who on any given voyage can total more than 40 percent of the passengers, have been the driving force in heavy bookings, particularly for Silver Spirit. The other big factor in the line’s success is its heavy international exposure. Perasso says the make-up of the guests is truly international. “No one nationality dominates, it’s a mixture,” he says. As we sail off from Monaco into the stormy Mediterranean the ship cuts through the water like a knife and the stability is impressive given the gale force winds. 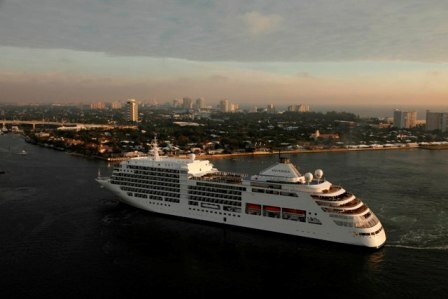 While Spirit is the biggest ship in the Silversea fleet it is still small and has the familiar layout of the line’s other vessels. But, it’s the ship’s classic Art Deco grace of the 20s and 30s that stands out – this is a ship Greta Garbo would have loved to sail on. The Restaurant, aka the main dining room, evokes an understated, but comfortable atmosphere. Aptly named, The Bar and adjacent lobby is a multi-use area and is the heart of the ship. Vintage nautical photos decorate the walls and plush chairs and sitting areas are everywhere inviting guests to linger. Indeed they do — Passengers gather at all hours to drink Bellinis or cappuccinos or just to relax to soothing musical entertainment. Deck space onboard is expansive with numerous comfortable lounge areas affording shade or sun allowing guests to choose their al fresco preferences. The 36,009-ton vessel offers 270 suites that range in size from 312 to 1,668 square feet (95 percent with balconies). All suites offer nifty technological advances including two large flat-panel televisions hidden behind mirrors and iPod docking stations. Guests lack for nothing in these suites. There is a menu of eight pillows to choose from, a selection of room scents from Laura Tonatto, a choice of Bvlgari or Ferragamo toiletries, and never ending bottles of Pommery Champagne and boxes of Pierre Marcolini chocolates. And, every suite comes with a butler who will not only unpack your suitcase but clean and freshen it as well. “It’s all about highly personalized service that’s what luxury is all about,” said Ken Watson, Silversea’s executive vice president and chief operating officer. The Spa at Silversea takes things to another level. At 8,300 square feet it is the largest in the fleet and features a beauty salon, fitness center, nine spa treatment rooms, two sauna rooms and two steam rooms. The spa also debuts a Thermal Suite, an exclusive spa area furnished with heated lounge chairs along with a private Hammam Chamber (Turkish bath), where guests can customize their scrub treatments. In addition, The Spa offers an outdoor relaxation area with expansive aft sea views and comes equipped with plush loungers and large whirlpool allowing spa lovers a place to relax pre- and post-treatment. Among the new spa treatments and services is the medi-spa offering a selection of physician-administered facial treatments using such popular wrinkle-reducing agents as BOTOX Cosmetic and the dermal fillers Restylane and Perlane. Guests can consult with the medi-spa physician on board to determine a personalized treatment plan. There’s also a new Oriental Medicine Program, which offers acupuncture therapy and Chinese herbal supplements. Perhaps the highlight onboard Silver Spirit is the culinary delights in the six restaurants. The line is celebrating its 10th anniversary partnership with Relais & Châteaux; the only cruise line afforded the honor. “This is a pillar of our culinary experience — to be precise and genuine,” says Rudi Scholdis, Silversea’s culinary director. He added that the line’s mix of guests and 423 ports visited is part of the culinary offerings. The line’s staple restaurants are here including The Restaurant, which offers 21 menus from International classics to inventions made on the ship. La Terrazza is the heritage of Silversea and offers freshly made pasta with ingredients flown in from Italy. The Pool Grille offers spa and quick fare and in the evening is offering a new informal dinner concept where guests can grill their meal on heated lava rocks. Le Champagne is highlight of the line’s association with Relais & Châteaux where for $30 guests can indulge in a six-course menu and for an additional $200 sample the wine pairing offerings. New dining venues include Stars Supper Club that is modeled after the Rainbow Room. The venue is more than dining, it’s “food-entertainment” said Scholdis. The ambiance is jazzy and offers a bite size tasting menu encompassing flavors from around the world. Indeed you could make a meal here if you order all 20 tastings. The live jazz singer who works the room makes this venue an unforgettable experience. Seating just 24 guests, Japanese-inspired Seishin features a large, round chef’s table as its centerpiece. Guests at surrounding tables can watch the chef at work sculpting fresh sushi and sashimi. There is a cover charge of $40 for the 11-course digestion menu that includes Beluga caviar and Kobe beef. For an additional $40 guests can enjoy a Saki digestion flight or for $200 a special wine flight. Ultimately, the real luxury of Spirit, though, is its focus on keeping the traditional cruise experience alive and highly refined. There are no rock climbing walls, gigantic water slides or ziplines like the new mega ships – it’s about surrounding oneself in luxury, fine dining, and like-minded travelers on a quest for new horizons. On January 21, Spirit begins its grand inaugural sailing with various itineraries in the Caribbean, South America, and Mexican Riviera. In May, the ship transitions to the Mediterranean where it will sail various 7-day voyages. In late October, Spirit transitions back to the Caribbean. Prices for 7-day voyages begin at $4,358. Visit Silversea Cruises Website for more details.